Debbie Menard (right in above photo) is the new General Manager for PWL Lac La Biche, and she took a moment amid the delivery of furniture and appliances, phone calls, human resources management, and inter-agency meetings to update us on Point West Living’s newest community; and to share a little bit about herself. Debbie has lived in Lac La Biche County all of her life, most of it around Plamondon, a tiny community, 30-kilometres west of Lac La Biche. She now lives on an acreage with her husband, a dog, three cats and two of her three working kids. Since those kids are now adults, the family no longer keeps horses and llamas. Debbie says she has a big yard and does a lot of flower and vegetable gardening. That and spending as much summer time as possible at the family’s lakefront camp on Lac La Biche. To make sure each resident receives a person-centered welcome, only two residents are scheduled to move in on each day. 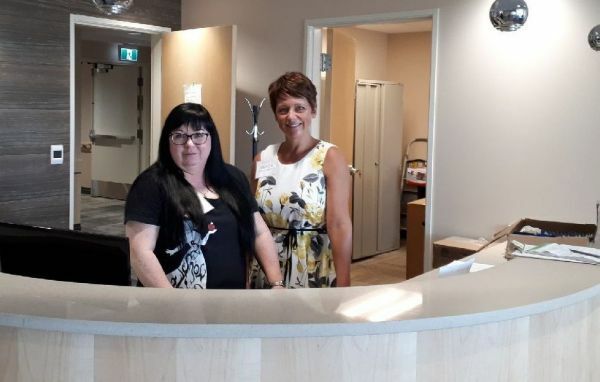 At capacity, PWL Lac La Biche will be home to 49 residents; 40 in Designated Supportive Living (24 of whom will be in memory care), and 9 in Independent Living. Lac La Biche is about a 215 kilometers northeast of Edmonton, about 230 kilometers ESE of Slave Lake, and 150 kilometers west of Cold Lake.